"'Sausage Party' pulls no punches, and despite a non-stop barrage of humour, the story never feels lost or half-assed." “What do the Gods want with us?” This is the question Frank the sausage (Seth Rogen) wrestles with as he slowly begins to realize that leaving the supermarket might not be the heavenly experience it’s cracked up to be. Maybe the Gods want to chop him up and throw him in a pot of boiling water, so by the time he finally gets inside his girlfriend, Brenda the bun (Kristen Wiig), he’ll be too dead to enjoy it. Or maybe the Gods want to slowly roast him over a grill until he splits a new crack. These are the deep metaphysical issues Sausage Party wrestles with, between making side-splitting jokes and taking offensive to levels not seen in film since Team America: World Police. Featuring an ensemble cast, Sausage Party pulls no punches, and despite a non-stop barrage of humour, the story never feels lost or half-assed. We start with a supermarket filled with food that are so excited to be picked up that they start every day by singing a song about how great it is outside those doors… Things start to go wrong when a bottle of honey mustard gets returned and is severely f*cked up from the horrors he saw on the outside. He then gets picked up again, put in Brenda and Frank’s cart, and starts to cause a ruckus making carts to smash and depriving Brenda and Frank (among others) from their chance to get to the outside and all of its wonders (or f*cked up savagery). Add, Lavash the Naan bread (David Krumholtz) arguing with Sammy Bagel Jr. (Edward Norton) about who gets the west shelf, and you get one of the most dysfunctional foursomes ever set out on a quest across a grocery store. All the while, Barry (Michael Cera) and Carl (Jonah Hill) find out what it’s like to be a hotdog in the real world. Insert sausage and bun sexual reference. 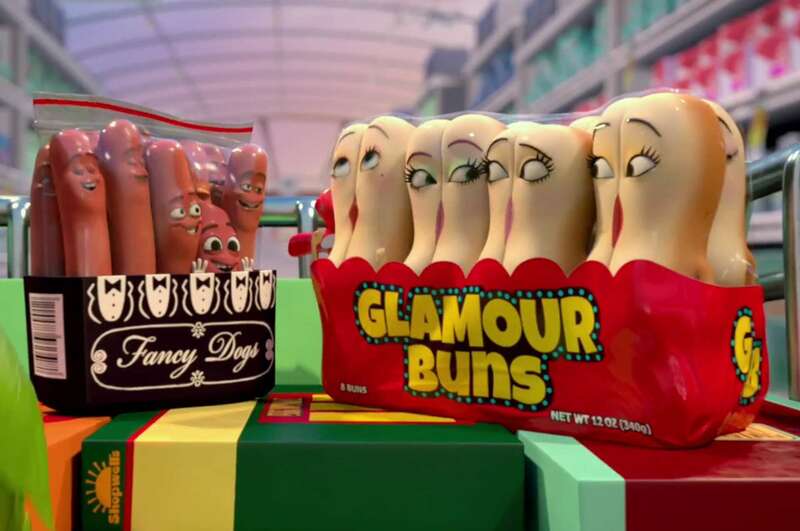 What is truly astonishing about Sausage Party is how well it keeps the humour and gags coming without detracting from the story—which is goofy, yes, but also deep with thematic undertones that could even merit film-study for years to come. The voice work is well done too. Aside from the unmistakable voices of Rogen and Hill, it took looking at the credits to figure out who some of the characters were voiced by. Norton does a spot on Woody Allen impression as the bagel and Krumholtz sounds like he could do a spot on Sasha Baren Cohen. James Franco voiced a human stoner as well, and instead of just voicing it like his other similar roles, he really seemed to put some effort in. That being said, even when you could tell who the voices were, it didn’t take away from the hilarity of their lines. I don’t want to ruin the plentiful amount of gags, but be warned; they aren’t for the uptight folk. Lavash and Sammy Bagel Jr. were surprisingly and thoroughly hilarious as the unlikely Muslim and Jewish duo, and Cera and Hill’s journey in the outside world was plenty f*cked up in its own way. 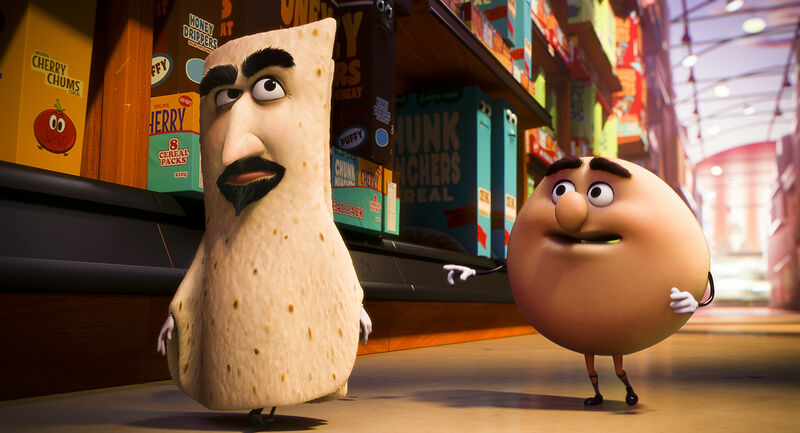 Lavash (David Krumholtz) and Sammy Bagel Jr. (Edward Norton) form an odd team indeed in Sausage Party. There isn’t much to complain about, although Sausage Party‘s narrative becomes a bit divided at times. While Frank’s journey to understanding is the core, there is a lot going on in this ‘Sausage Party’, unfortunately diffusing the focus thin at points. Once Cera and friends leave the grocery store, their story drops off the map, and there wasn’t much more to their arc other than what we saw in the previews. It does get better once Barry escapes and winds up at the stoner’s house; however, it takes a while to get there, and then near the end, Barry’s story has another gap that introduces some great characters despite the cost of fracturing the story’s logic. Logic? Yeah, this is a movie about talking food; logic need not apply. So as long as you’re not offended by every stereotype ever, foul language, loads of sexual references, and some content best put in the ‘truly f*cked up’ column, Sausage Party is sure to delight. While it’s not a masterpiece of film, it comes surprisingly close. If you don’t mind constant references to other movies and have that special kind of mind that doesn’t mind spending 90 minutes in the sewer with the lowest type of humour, this a must see.